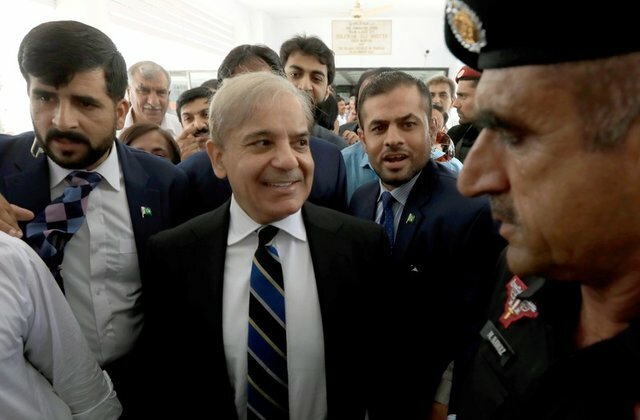 Probashbangla24 online Desk : Pakistani opposition leader Shehbaz Sharif was ordered jailed on Saturday for 10 days after being arrested in a corruption case, his lawyer said, meaning he will not be able to campaign for his party ahead of crucial by-elections next week. Sharif is the younger brother of ousted Prime Minister Nawaz Sharif, who was sentenced earlier this year to 10 years in prison by an anti-corruption court after the Supreme Court removed him from power. Friday’s arrest of Shehbaz Sharif by agents of the National Accountability Bureau (NAB) in Lahore involved a case of alleged corruption in a low-cost housing scheme when Sharif was chief minister of Punjab province. A NAB court on Saturday heard charges that Sharif in 2014 illegally canceled a contract with a construction company and sought to award it to another company, allegedly for a bribe. Hundreds of activists from Sharif’s Pakistan Muslim League-Nawaz gathered outside the court, chanting pro-Sharif slogans as police and army Rangers guarded the venue. Lawyer Tarar said that Sharif was improperly arrested on a warrant that was kept secret. Sharif went to the court for questioning in another corruption case involving a water purification scheme but instead was arrested on the housing project warrant. “They cannot arrest the leader of the opposition in this manner,” the lawyer said. The Sharifs’ Pakistan Muslim League-Nawaz came in second place in the general election. Their party denounced the polls as rigged, alleging the military and courts tipped the scale in favor of Khan’s party, a charge the army and judiciary deny. The PML-N says that the arrest of Shehbaz Sharif was intended to weaken the party before by-elections to be held on Oct. 14. The voting could affect the slim majority Khan’s coalition government holds in parliament, though many of the constituencies are considered strongholds of his Pakistan Tehreek-e-Insaf (PTI) party.